Stage West Theatre’s sixth annual Music, Arts, Drinks and Eats festival known as M.A.D.E. : An Indoor Arts and Music Festival, will be held on July 7, 2019 with expanded public hours from 12pm-7pm. Stage West’s season ticket holders and Patron Member donors will receive exclusive priority access to the event at 11am. The 16,000 Stage West Theatre space will be open for 32 vendors of fine art, crafts, wearables, edibles, etc. at a cost of $75/space. The admission process will be based on proposed product and quality of items. Got something for the kiddos to do? That’s a bonus. An effort will be made to not have more than one of the same type of product represented at the event. Venders will be responsible for setting up their own areas. This is an indoor event. Set-up will take place the day before July 6 between 1pm-4pm or the morning of July 7 between 8:30am-10:30am. All vendor and personnel vehicles must be moved to the rear of the building before 10:30am. All vendors must have their spaces cleared out by 8pm on the night of the event. Vendors are responsible for their own setup, inventory, and sales. 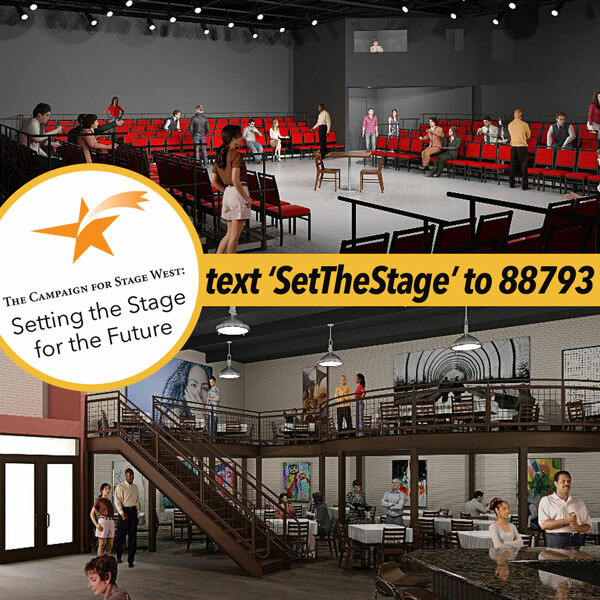 Submit 5 photos/examples of the proposed product to MADE [at] stagewest.org (subject: MADE%20vendor%20inquiry) no later than May 15. If accepted into the 2019 M.A.D.E. Festival, applicant has 10 days to pay the $75 non-refundable fee to reserve their space or said space is forfeited to the next vendor on the invite list. All booths must be set up to accept cards as well as cash and be open for the duration of the festival. All booths must meet set-up deadlines and bring their own tables, chairs, and screens, if utilized. Finally, all vendors are asked to help promote the event through social media and personal mailing lists. Stage West will create postcards that can be passed out. 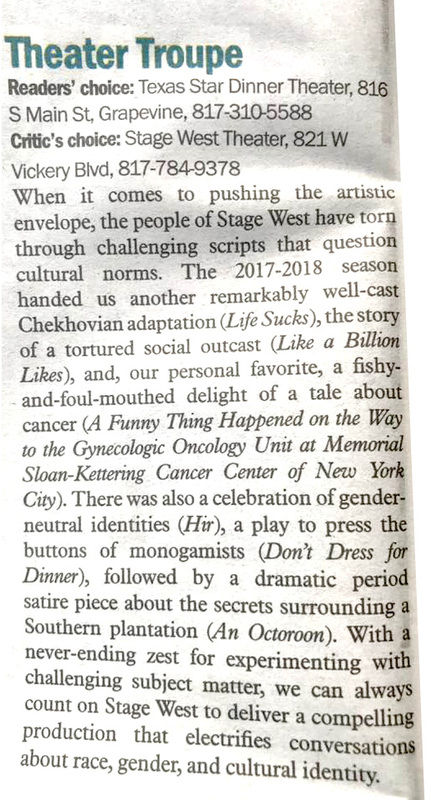 Stage West is a not-for-profit live theatre. M.A.D.E. doubles as a community event and fundraiser. Be a part of our future! Anyone can help by texting “SetTheStage” to 88793! Our parking renovation is complete and all railings are in! There are 2 designated handicap spaces, and two ramps. The easiest ramp to the front door is to the left of our parking area, next to the barrels. Thank you again for your patience and support! This year we received over 200 submissions to the Neighborhood Play Contest. Here are the Winners, whose submissions will be performed at the Festival of the Kid. The Honorable Mention submissions follow. Our accessible parking project continues! Keep your eyes open for an ENTER HERE sign on the door of either 821 (Lobby Cafe & Main Stage) or 823 (rehearsal hall and offices) to indicate which entrance to use. We are getting there! BREAKING NEWS: Parking lot update! If you've been to our space before, you will be aware that the parking area in front of our building is on an incline. For the next couple months, the city is redoing that parking area for safer access. This is wonderful news! While this construction is underway, please plan to arrive 30 minutes prior to curtain to ensure plenty of time to navigate the construction. We expect access from the street to change locations from day to day. You may, for example, be asked to enter our facility through our rehearsal hall if the usual entrance is blocked. Access points should be apparent upon approach. This project means 10 less parking spaces during the construction time-frame so we encourage early arrival to accommodate walking an extra block especially on November 2, 3, 9, 24. For alternative access through the back of the building, please pre-arrange by calling us at 817-784-9378 so that we can let you in! Thank you so much for your understanding and patience as we work with city to improve the patron experience (and parking lot safety) at Stage West. You’ve been asking for it! And it’s finally about to happen. Thanks to our friends at Near Southside, Inc. and at City Hall, the parking area in front of Stage West is getting a make-over! A beautiful, level, fully accessible parking area and entryway. What does it mean for the next few months? Once construction starts, there will be non-production days where the only entrance to our facility is at the rear of the building. If you need us on those days, please pre-arrange your visit by calling our box office 817-784-9378. This will mostly affect walk-up ticket buyers, students, actors, and staff. If you forget, it’ll be quickly apparent if you can’t come through the front. Drive round to the back. We’ll post the phone number on that door as well and come back to let you in. During performance hours, the construction team has pledged to make an entry way through the front. Start date should be October 1, and we expect that it will finish up by late November. Plan extra time for your arrival. It is estimated to be a 6-8 week project. Fingers crossed! Finally, a special thank you to all of you who wrote letters of support to the city regarding this project. You had a major impact on the success of this being given a green light! North Texas Giving Day is a special day for all non-profits in the area, including Stage West Theatre! This year’s event is from 6am-12am on September 20. All gifts given to our organization that day will receive an in-house match from the Swenson family. The Swensons will generously triple your contribution, helping your money go even further towards our $25,000 goal. There are additional BONUS FUNDS provided by the Communities Foundation of North Texas. The Communities Foundation will enhance, on a pro-rated basis, each donation made during North Texas Giving Day. Credit card gifts will be eligible for the bonus pool to the value of actual donations prior to deduction for the fees. It is not a dollar for dollar match. The bonus percentage will be calculated the day after North Texas Giving Day. Watch this video to see how the bonus is calculated. 1) Scheduled Giving: New this year, donors may visit northtexasgivingday.org between September 10 at 8am through September 19 at midnight. Enter the organization name Stage West and follow the directions from there. The donation will be processed on Giving Day itself. 2) Day-of Giving: between 6am-12am on September 20, visit northtexasgivingday.org. Enter the organization name Stage West. Follow the steps from there to make your gift to our theatre. There is also a local event that you are welcome to attend. It is in celebration of the day and most every Fort Worth non-profit will be represented. We would love to see you there. Thank you for participating on this exciting day of philanthropy and for helping to make great live theatre possible at Stage West!